This space wallpaper, snapped by NASA/ESA Hubble Space Telescope, shows the star HD 184738, also known as Campbell’s hydrogen star. This space wallpaper, snapped by NASA/ESA Hubble Space Telescope, shows the star HD 184738, also known as Campbell’s hydrogen star. It is surrounded by plumes of reddish gas — the fiery red and orange hues are caused by glowing gases, including hydrogen and nitrogen. 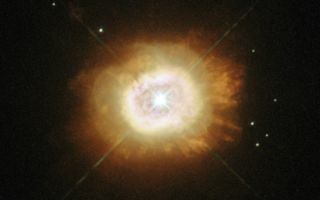 HD 184738 is at the center of a small planetary nebula. The star itself is known as a [WC] star, a rare class resembling their much more massive counterparts — Wolf-Rayet stars. [WC] stars are low-mass Sun-like stars at the end of their lives. While these stars have recently ejected much of their original mass, the hot stellar core is still losing mass at a high rate, creating a hot wind. It is these winds that cause them to resemble Wolf-Rayet stars. This image was released Sept. 16, 2013.